Card games and poker nights have long been traditions among family and friends, and as these gatherings become larger and more frequent, the tables we gather around grow in importance as well. Homemade game and poker tables are a creative way to customize your table to the size of your game night gang and add a dash of personalization while you’re at it. And whether table-making is a hobby or if you’re just looking to save money by building your own, The Foam Factory can provide the materials you need to make a homemade card table that’s as nice as the ones on the Las Vegas Strip. One of the most important components of a card table is also something that few people are aware is included in their construction. Proper card and gaming tables have a table pad made of foam placed between the table’s wood surface and the fabric playing surface, for multiple reasons. The most obvious benefit is that it softens the playing surface and keeps chips and dice from bouncing wildly, breaking, chipping the table or making too much noise. The soft playing surface also provides enough give to allow for cards to be slid under one another for games like blackjack. Few foams are able to provide all of these characteristics while maintaining resiliency and not sagging or forming soft areas. 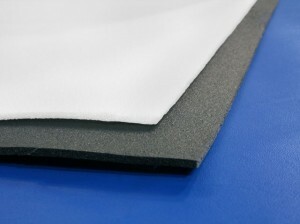 Polyethylene roll, a closed-cell foam, is one material that can and will hold up to any card game’s abuse. Yet another reason table foam is included in poker table construction is because it helps protects against spills and condensation. Being closed-cell in structure, polyethylene roll will not absorb moisture the way open-cell foam will, containing spills to the table’s surface where it can be easily cleaned without worry of moisture reaching and damaging the table’s wooden frame. The Foam Factory offers 2 pound density polyethylene roll in 60 inch widths that can be ordered by lineal feet or in rolls of 50 or 100 feet, should you plan on making multiple tables. This waterproof pad can be ordered in the typical 1/8 inch thickness used in table padding, as well as the also used ¼ and 3/8 inch thicknesses and more. A less-surprising application of foam in poker tables is as the railing along the table’s edge, for leaning on during play and keeping the table’s contents from sliding off. Often encased in vinyl, these rails provide a soft cushion for players to lean on during the game and can also house cup holders for drinks, keeping them off the playing surface. Rail foam needs to be made of durable and resilient foam because of the weight and pressure of people leaning on it while staying comfortable as long as the table lasts. For this reason, rail padding will be thicker than the card pad under the fabric, and made of a more cushioning material as well. The Foam Factory offers multiple choices, in both open and closed-cell varieties for selecting the material that best suits your preferences for the elbow cushion on your card table. Open-celled, firm and resilient, Lux High Quality is a material most commonly used in seating cushions and bedding, attesting to its ability to handle use. A shock absorbing foam, it can support the weight of a player leaning on it without caving in or making them feel unstable. For custom table pads with closed-cell durability and moisture resistance, gymnastic rubber is also offered by The Foam Factory. This material can be cut to thicknesses of 1/8, 1/4, 3/8 and 1 inch for the perfect balance of firmness and cushion for you and your card buddies. Full sheets of gym rubber run 96 by 48 inches, with rectangular half sheets 96 by 24 inches and square half sheets at 48 by 48 inches. For a budget-conscious table, open-cell poly foam also features a balance of comfort and support and can be cut as thin as ¼ of an inch. Railing heights are generally suggested to be around 1 inch thick, but with a homemade game table, you can make them as thick or as thin as you want. Gymnastic rubber is available in solid sheet thicknesses up to 2 inches, poly and Lux HQ are both available in 8 inch thicknesses, and all materials can be laminated together for additional height. Beyond card table supplies, The Foam Factory is also able to manufacture custom pool table covers. These covers can slide under the table’s bumpers or rest atop the entire frame, transforming it into another usable surface in the home. These covers protect against dirt, debris, spills and other accidents while the pool table is not being used. Made of sturdy polyethylene foam, covers can be cut as thin as ¼ of an inch with any height greater than that able to be created. With the full sheets of polyethylene measuring 48 by 108 inches, virtually every pool table is able to be covered. These forms also include the option to be covered in black vinyl for a more aesthetically pleasing surface that is also easy to clean. Covers can be manufactured as solid pieces or made into multi-section covers, connected into one form by the seams. For more game night accessories, The Foam Factory can also replace worn out foam in a basement bar or kitchen stool cushion. If you’re looking to build your own table, repair or refurbish an existing one or just protect one, The Foam Factory has the materials and capabilities to help you make your game nights a royal flush. There’s definately a lot to learn about this subject. I love all the points you have made. 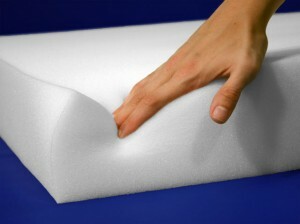 What we suggest is our polyethylene roll or Volara foam. Volara is a higher quality and more smooth. 3/8″ thick. We would suggest 1″ of our polyethylene foam, in either a 1.7lb density or 2.2lb density. You can purchase the sheet and cut it down or we can cut the foam down to the size you need for a fee.